Marine species thrive under specific environmental resources. Due to the observed effects of climate change, metocean conditions within their habitats are threatened. In turn, this threatens the species themselves. As Earth Observation (EO) images are becoming increasingly available, we are seeing great opportunities for applying Big Data science and technology to address such environmental challenges associated with climate change. The aim of our work is to automate the extraction of new knowledge using EO Big Data analytics to reveal emerging behaviour of marine species to the changing metocean environmental trends. 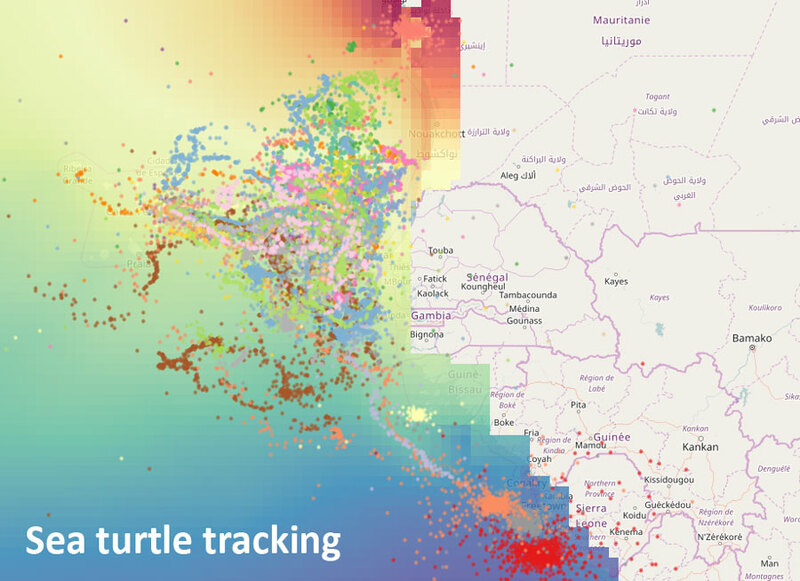 Visualisation of migration patterns for sea turtles in which the colours of the ocean reflect sea temperature information obtained from satellite data. Whilst there is an increasing amount of data available from satellites, it is non-trivial to obtain and process intelligently. Our recent paper on this subject stems from work in the EO4wildlife project, presenting an advanced Big Data platform making data accessible to end-users such as biologists. With specialised Big Data mining and high level fusion based analytics tools, we help expose new insights on marine species emerging response to climate change. IT Innovation presented two additional papers at the ISESS conference, on applying data science, processing, fusion, analytics and reasoning in the environment space. Specifically, addressing issues such as security and resilience of critical infrastructures with respect to illicit human behaviour and rare natural geohazards. This work stems from the ZONeSEC, INFRARISK and DESURBS projects. — Zoheir Sabeur, Gianluca Correndo, Galina Veres and Banafshe Arab-Zavar in collaboration with Atos Spain, Atos France and Collecte Localisation Satellite (CLS). — Zoheir Sabeur, Zlatko Zlatev, Panagiotis Melas, Galina Veres, Banafshe Arbab-Zavar and Lee Middleton in collaboration with Thales, Research and Technology Group, Palaiseau, France.